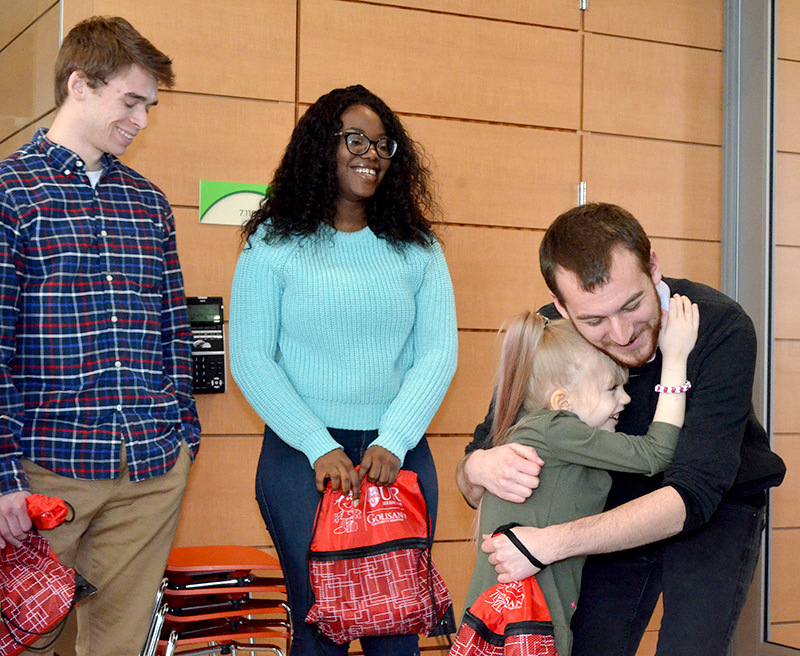 Gracyn Chappell’s eyes widened appreciably as she approached a mysterious tube filled with water in the play room at Golisano Children’s Hospital. “Push the buttons, baby,” Kate Chappell prompts her 5-year-old daughter, who was completing a 22-day stay at the hospital. And just like that, air bubbles began gurgling up through the water. They are tinted with red, then green, blue, purple, and pink light as Gracyn enthusiastically pushes different color-coded buttons. “Oh, my goodness!” she exclaims gleefully. Clearly, the “Biscotti Bubble Machine” — created as a senior design project by University of Rochester chemical engineering students — is a big hit with Gracyn. The Golisano nurses and specialists who gathered for the unveiling are impressed as well. And it took only one semester. 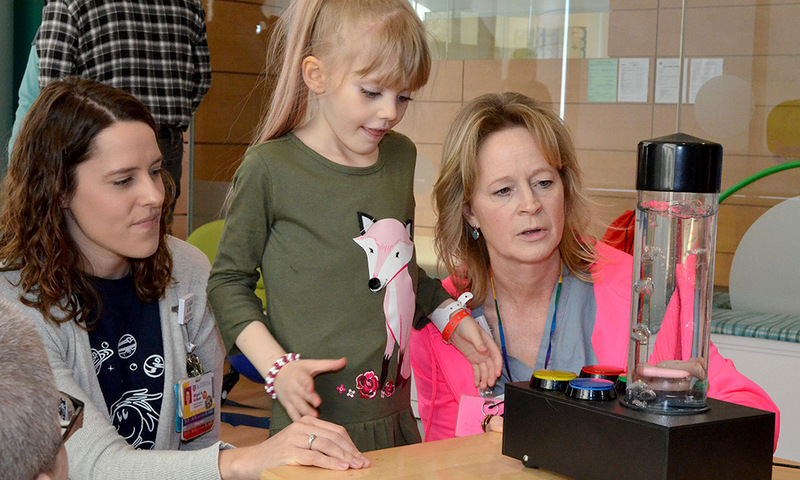 In this case, Wendy Lane, Golisano’s Child Life program coordinator, proposed a smaller version of a large bubble machine the hospital already has – one that could be used at a child’s bedside and be easily operated even by a child with physical disabilities. not easily tip over, but still be portable, waterproof, and easy to clean. integrate button-activated LED lighting, a water pump, and an Arduino control board within the base. easily generate a “soothing” combination of bubbles and colors within the water column protruding out of the top of the base. “Each of us have had some coding background, but this project was really coding and wiring intensive,” says Dairo. So, the students took tutorials and got extra help in Arduino programming from Scott Russell, a lecturer and senior technical associate in the Department of Mechanical Engineering. The team debated whether to put the light activating buttons on a separate control box, which is still an option. However, in the interests of time, they ended up incorporating the buttons into the base. Thanks to John Miller, the senior laboratory engineer who runs the machine shop in Taylor Hall, they delivered their working prototype on time. Best of all, Ruff estimates, the cost of materials for the device – not counting labor and fabrication – is only about $125. “So, a positive takeaway from this is that we can cheaply replicate these units for much less than the one in use at the hospital,” he says. And Monfredo definitely has replication in mind. The group will work with Miller on creating additional bubble machines for Golisano “so you don’t have just one; you could have a dozen,” Monfredo says. Community agencies that serve disabled children have also expressed interested in obtaining the device. Porceng is also working with students in an entrepreneurship class taught by Duncan Moore, the assistant provost for entrepreneurship, on developing a business plan. In the meantime, the Biscotti Bubble Machine team is basking in the glow of a job well done. The ultimate validation came from 5-year-old Gracyn Chappell. Twice, she broke away from the bubble machine to run over and hug the students. “My heart was just melting,” Porceng says. « What’s the problem with civility?